More and more our customers in Garden City are asking how they can make a sectional sofa work in their home, and we’re glad to see these pieces gaining more popularity! These versatile pieces of furniture are great for maximizing space in rooms of all shapes and sizes, plus they are very customizable and can fit in unique spaces. But, because there are so many styles and shapes available, the terminology can be confusing for first-time sectional buyers. We hope this post will help demystify the sectional! The first thing to understand about a sectional sofa is that it is comprised of two or more individual parts that fasten together by metal brackets located on the side of the piece. This is a great thing for customers because it means that you can often ask for individual pieces to create a custom sectional to fit the size of your home. If the configuration you want isn’t in stock, just ask about special ordering to get exactly what you want! Depending on the manufacturer and the style of the sectional, you might have different pieces available. For an L shape sectional, you will be able to choose from a three-seat cushion sofa part, a two-cushion loveseat part, and a single-cushion square connector part. Some styles may also offer a chaise piece, which is similar to a loveseat in size but features a single long cushion and no back on one side. But to properly configure these parts, you need to understand the difference between right-arm facing and left-arm facing pieces. The designation right-arm facing and left-arm facing, abbreviated as RAF and LAF, simply refer to the side on which the arm is placed if you are looking directly at the sectional piece. So if you were looking at a sofa piece and there was an arm on the right-hand side and nothing on the left-hand side, that would be an RAF sofa piece. For a traditional L shaped sectional configuration, you will likely end up with one RAF and one LAF piece. But depending on which way the sectional will be facing in your room, you may want a longer RAF sofa part and a shorter LAF loveseat connected by an armless corner wedge part or vice versa. For help determining which is right for you, just ask an associate at Garden City Furniture! We’ll make sure that you order the right parts for your home! Many larger sectionals have reclining options, whether it is powered electronically or not. And if you are looking for a top-of-the-line sectional, you should ask about ones with adjustable lumbar support and headrests. These sectionals are great for the living room or for a theater room because each person can adjust their seat to get the perfect level of comfort. Plus, some sectionals feature built-in consoles and cup holders to make the piece even more functional! 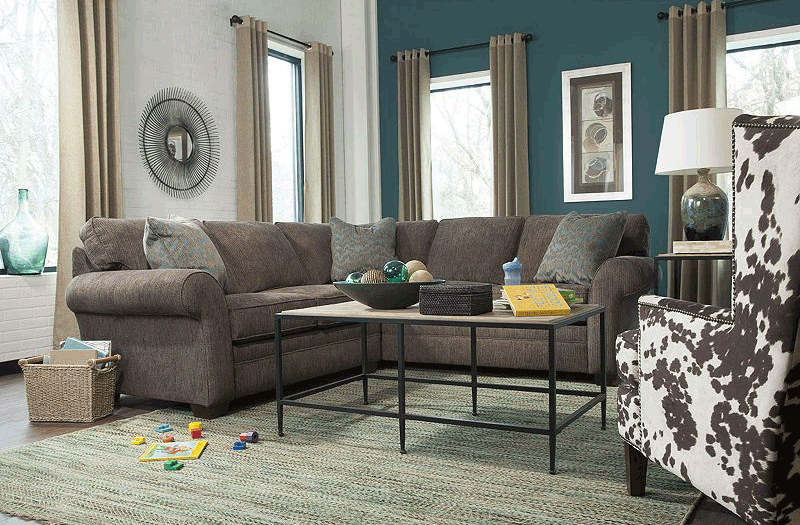 For a lower price option with a great feel, try a microfiber or microsuede sectional sofa. These durable fabrics are soft to the touch and will give you big bang for your buck. But for the most style and durability, look for a top grain leather sectional. You can find leather sectionals in all colors, from browns to whites and grays. These options are pricier, but the leather is easy to maintain and should last you for many years to come! Sectionals are great options for every home because they maximize the seating for any space. If you are interested in buying a sectional for your home, visit Garden City Furniture to see what styles are available now or ask about ordering a custom piece. Plus our associates can help you finish the look with a coffee table or area rug that brings the entire room together!